Medicare Advantage (MA) markets are significantly more robust, with higher private insurer participation and lower average premium growth than the Affordable Care Act (ACA) marketplaces. The programs differ in insurer participation, the risk-adjustment system, and provider payments. Use a higher benchmark than the second-lowest-cost silver plan for calculating premium tax credits. MA's success lays out a possible model for the ACA marketplaces. By adopting policies geared towards increasing enrollment in marketplace plans as well as insurer participation, the ACA marketplaces could become stronger and more stable. Copyright January 2018. The Urban Institute. Permission is granted for reproduction of this file, with attribution to the Urban Institute. 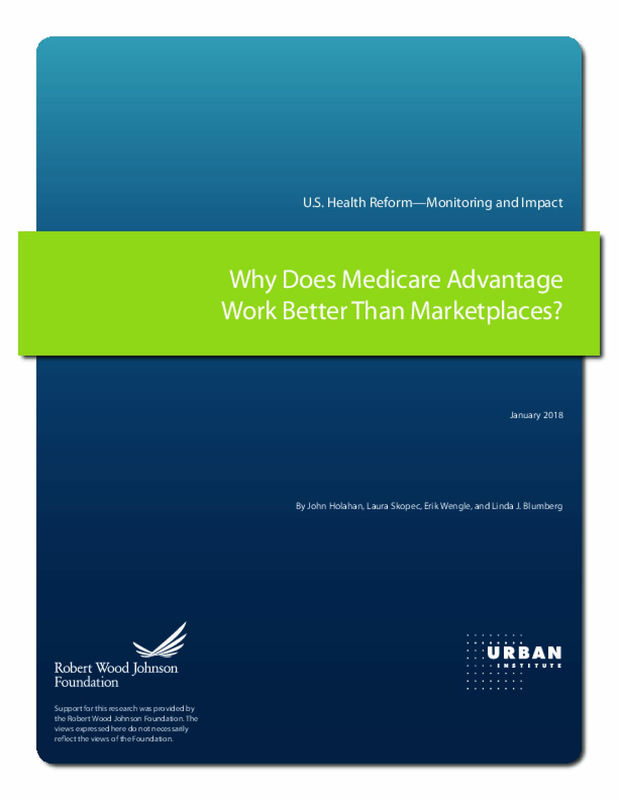 Title: Why Does Medicare Advantage Work Better Than Marketplaces?